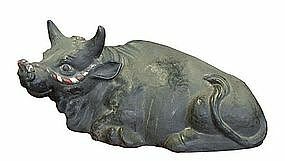 Antique Japanese reclining black bull, wonderfully sculpted, painted low-fire ceramic, Meiji Period (c. late 1800's). 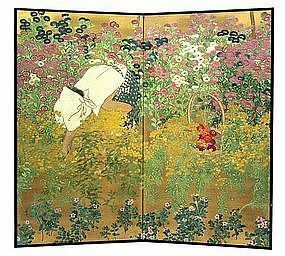 Size: 11" high x 23" long x 11" deep. 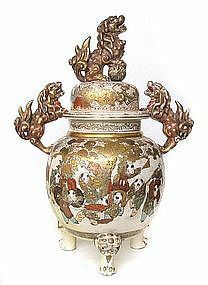 Gorgeous and dramatic antique Japanese Satsuma ware lidded container, stands on 3 legs, decorated with three lively fu-dogs, body is decorated with designs of noblemen on one side and children playing on the other, minor repair to one leg, Meiji Period (c. 1880's). 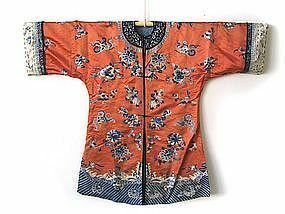 Size: 17 1/2" high x 13" wide. 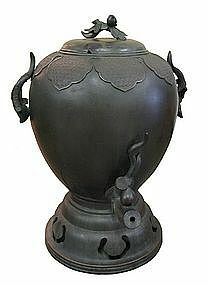 Very large antique Japanese bronze temple water dispenser with handles and spout in the form of peach tree branches, Meiji Period (1868-1912). 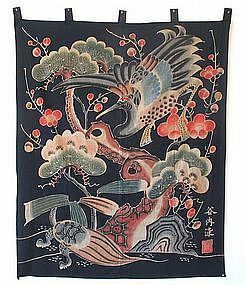 Size: 29" high x 21" wide. Japanese silver spoon made in the shape of a Japanese round fan, spoon handle made to resemble the bamboo handle of a fan, pierced characters in center of relatively flat shaped spoon, mark on back of spoon reads "Sterling 950". Size: 5 7/8" long x 1 3/4" wide. 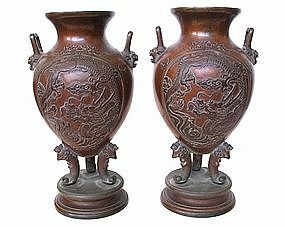 Beautiful antique Japanese bronze vases with raised design of dragons on one side and phoenixes on the other, each vase inscribed, label states that these vases were presented by Members of Congress of Fukuoka Prefecture, Meiji Period (1868-1912). Size: 11 1/2" high x 6" wide. 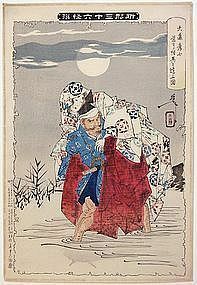 Japanese woodblock print by Yoshitoshi, from "36 Ghosts" series. 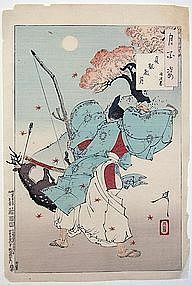 Japanese woodblock print by Yoshitoshi, from "100 Aspects of the Moon" series.